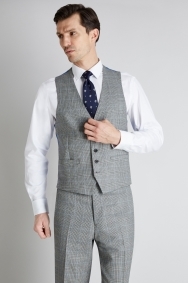 Look sharp and feel ready for any occasion in this smart waistcoat. Going somewhere special? 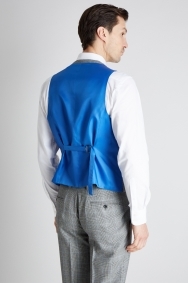 Make sure you look the part with this black, white and blue waistcoat from the masters at Savoy Tailors Guild. Subtle checks add interest and keep you on-trend, while the waistcoat has a versatile blend of colours for effortless coordination with your favourite shirts. With a matching jacket and trousers available in this design, you can be sure to turn heads for the right reasons when you step out in the complete 3-piece suit. Excellent Garment and well made, very good fit. Great fit and comfort. Bargain sale price. True fit. Material is beautiful as is the tailoring. A quality item. Loved the suit,unfortunately did not fit as planned. Great colour, great price. I really can't fault it and I'm very pleased with the suit. Plus I purchased it in the sales, which is a bonus! Great purchase, a tad bit pricy in comparison to the other purchases but it is worth it. Quality material, well made and good fit. Elliot couldn’t have been more helpful. Great helpful staff, your staff are very patient ? ?